Includes Goblin Buckler Gun Promo Card. A devilish invading armada is bent on subjugating the islands of the Shackles, culminating in an epic battle at the edge of the Eye of Abendego using whatever forces you can muster. If you manage to defend your home against betrayal, danger, and the Empire of Cheliax, then you can assume your place at the head of the Pirate Council and take the mantle of the Hurricane King for your own. 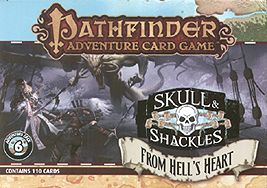 The Pathfinder Adventure Card Game: From Hell's Heart Adventure Deck is a 110-card expansion featuring fantastic loot, plunder, ships, villains, and 5 new scenarios that make up the complete "From Hell’s Heart" adventure. Bring your character’s legend to its apotheosis with the Pathfinder Adventure Card Game: From Hell’s Heart Adventure Deck. This deck requires the Pathfinder Adventure Card Game: Skull and Shackles Base Set, The Wormwood Mutiny Adventure Deck, the Raiders of the Fever Sea Adventure Deck, the Tempest Rising Adventure Deck, the Island of Empty Eyes Adventure Deck, and The Price of Infamy Adventure Deck.